Hi, I'm Sasha. I love traveling, occasionally enjoy karaoke, ride a Vespa and can't function without coffee. I live in Brooklyn, NY and get paid for designing and thinking about digital products, platforms and services. In both life and work I obsess about details and tend to value minimalism, efficiency and purpose. Although Brooklyn will always be home, I think I can be convinced to move to either Mexico City or Tokyo. Maxx&Unicorn Mahogany Bifold Wallet: Slim, lightweight and made of high quality materials it's only getting better over the years. Rollie Nation Derby Oxfords: They are incredibly lightweight, comfortable and can be worn for pretty much any occasion from light hikes to formal events. Timbuk 2 Bag: This has been a trusty travel companion for more than 10 years. From business day trips to 2 week long excursions, it has always impressed me with its build quality and how much stuff it can fit. Timbuk 2 has replaced and updated this model since purchasing, but the fact that it looks so great after so many years of travel is testament to how great the bag is! What’s your favorite travel hack? I find that a lot of people pack too much stuff when they travel so my hack is to pack only the things I absolutely need. I've been able to travel for as long as 2 weeks with only a backpack while still wearing a fresh set of clothes every day. Roll clothes to save space and leave that DSLR at home. 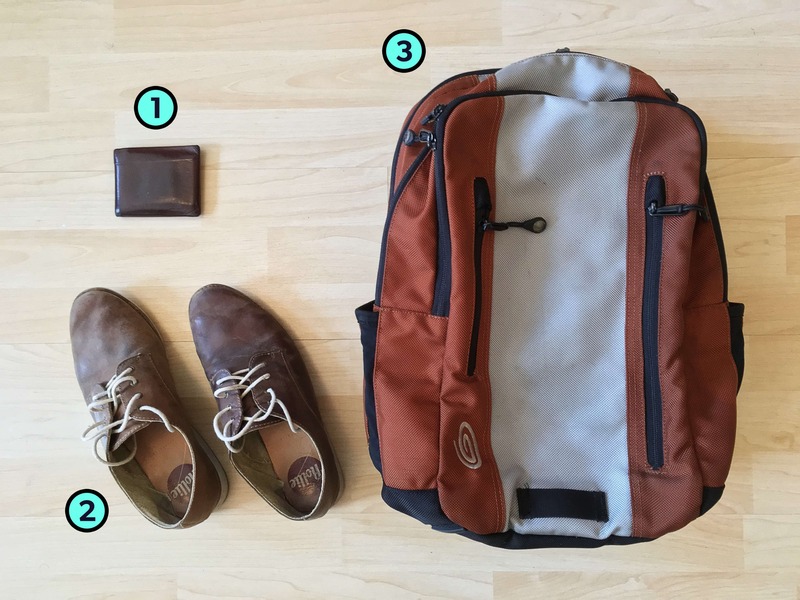 Are there any pieces of everyday gear or travel technology you wish existed that don’t? Shoes that can be compacted during travel. Travel underwear and socks that take up less space than the regular kind. What do you miss most when you travel? My pillow. Could there be a pillow you inflate that's as comfortable as my own? Maybe it's a pillow that can be used in various positions on planes and buses, without taking up a ton of space while traveling. You can find Sasha on Twitter and Instagram.